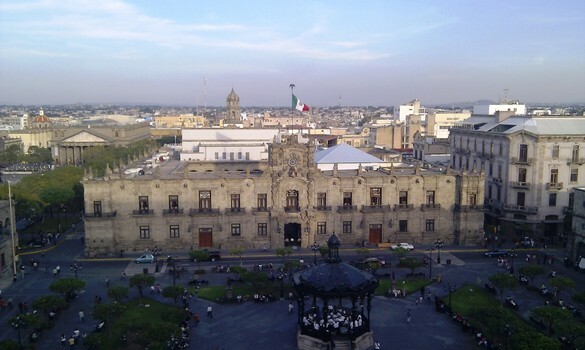 GUADALAJARA, JALISCO – Although a huge metropolitan area, Guadalajara, the city of mariachis, is surprisingly manageable for the visitor, with the main areas of interest being concentrated in and to the immediate west of the centro historico. Unlike Mexico City, with its frenetic pace and perpetually stressed population, Guadalajara is much more laid back, and the Tapatíos (as the city’s residents are known) generally relaxed and happy. From the airport in Guadalajara, it is a 300 peso taxi ride to the center of the city, not unreasonable given the relatively long distance, and the traffic can be heavy, depending on the time of day. We chose to stay at the Hotel One Guadalajara Centro Historico, located directly on Plaza de Armas, in the heart of the city. It’s a great location, convenient for exploring the center of the city, and with excellent connections to other parts of the city using the extensive bus network. First stop for lunch was at Kamilos 333, the best place in town for ‘Carne en su jugo’, a local specialty, which is a type of beef stew, cooked with bacon, beans and a flavorful broth, including cilantro among other ingredients. The better known Karne Garibaldi is right next door, and a fierce rivalry exists locally, however for my money, Kamilos 333 offers the better experience. Other ‘not to be missed’ culinary delights in the city include the famous ‘Torta Ahogada’ (literally ‘drowned sandwich’) which is a crunchy baguette style pork sandwich, drenched in a tomato based sauce, and Pozole, a pork and corn soup with tomato base. As one would expect in a city of 6 million, there is a vast selection of eating and drinking establishments, with the centro historico being well supplied. Slightly more upscale is the area centered around Avenida Chapultepec in Colonia Americana, a 30 minute walk west from centro, or a short bus or taxi ride. Wandering around, we came across York Pub, a new addition to the Chapultepec scene, which offered a moderately authentic British pub atmosphere, great service and very reasonable prices. Tapatíos love football (soccer), and Guadalajara boasts two top teams, Chivas and Atlas, each of which play at their own dedicated stadium. Having previously attended a Chivas game at the new Estadio Omnilife, this time we chose to watch Atlas play at the 54 year old Estadio Jalisco, which we found to be much more atmospheric than the newer and fancier facility used by Chivas. It’s also much easier to access, being only a few kilometers north of the center, on the route of the Macrobus. An interesting side trip is the city of Zapopan, immediately to the north of Guadalajara, and part of the same metropolitan area. Accessible via the comfortable TUR bus service, for 12 pesos per person, Zapopan is best known for being the home of the Virgin of Zapopan, an image of the Virgin Mary, dating from the 16th century, which has been credited with a number of miracles, and which is to be found at the basilica. Less famous, but our main reason for visiting, are the seafood restaurants, offering fish and seafood brought fresh daily from the pacific ports. Fresh oysters and patas de mula (a type of black clam) are an excellent choice, and at 70 pesos for a dozen, reasonably priced. The weather at this time of year could not be better – warm and sunny in the daytime, with highs around 29°c / 85°f, and overnight lows a cool 6°c / 43°f. Rain is virtually unknown during the winter. If you fancy a Mexican big city experience, but can’t face Mexico City, then look to Guadalajara – La Perla Tapatía – it may be just what you are looking for.